Peppermint Oil is collected through steam distillation from all parts of the plant. The peppermint plant is what resulted from the cross-pollination of the watermint and spearmint plants. It has no seeds and populates from its spreading vines. Peppermint oil has a long history of usage that goes back thousands of years. Ancient Egyptians placed peppermint in their tombs, ancient Romans and Greeks used peppermint in their cooking, to ease stomach problems, and to flavor wines. The peppermint plant originated in the Middle East and Europe, but now is grown in many areas around the globe such as Asia and North America. Peppermint oil possesses antiseptic, anesthetic, antiviral, antibacterial, antifungal, disinfecting, astringent, anti-inflammatory, anti-nausea, and insecticide properties. Isagenix Peppermint Essential Oil is safe for internal, topical, and aromatic applications when used in accordance with manufacturer’s recommendations. 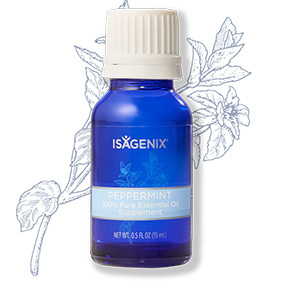 Isagenix Peppermint Essential Oil is used in a variety of internal and external ways to aid personal health care, to benefit environmental wellness, and to disinfect household surfaces. The oil has strong therapeutic, aromatic, anti-aging, and healing properties. Topical use of Isagenix Peppermint Essential Oil helps with: pain relief for backaches, headaches, sore muscles, inflammation, infections, and swollen joints, fever reduction, immune system protection, skin health improvement, healthy hair nourishment, acne reduction, bug bite prevention, itch relief, congested respiratory relief, digestive tract relief, abdominal pain relief, cough, cold and flu relief, insect control, and household bacterial disinfection. 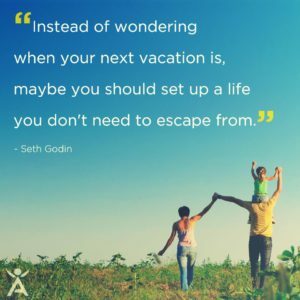 Aromatic use of Isagenix Peppermint Essential Oil helps with: hunger cravings, sore throat and sinus congestion, mental stress and exhaustion relief, energy levels and mood enhancing, nasal muscle relaxation, allergy relief, muscle pain, strain, spasms, and tightness relief, and odor elimination. Internal use of Isagenix Peppermint Essential Oil helps with: sinus cavities and nasal passage congestion, bloating, irritable bowel syndrome (IBS), urinary tract infection (UTI), bad breath prevention, hunger control, immune system protection, and nausea relief. Topical Uses: (a) Undiluted – 1-3 drops of oil in the washing machine for fresh scented laundry, 4-6 drops of oil in the bath water for a relaxing soak, or rub a few drops of oil onto bed linens for relaxing sleep; (b) Diluted – mix one drop of oil with 10-12 drops of the carrier Isagenix Essence Coconut Application Oil prior to applying to the desired area. Internal Uses: Add 4 ounces of liquid for every 1 drop of essential oil to be ingested. Due to the strength of a pure essential oil and to avoid searing to a plastic surface, it is best to mix the pure essential oil in a glass or ceramic vessel. PRECAUTIONS: Prior to the first application of Isagenix Peppermint Essential Oil, test for possible skin sensitivity by applying oil to a small patch of skin prior to use on large skin areas. Keep out of reach of pets, small children, and infants. If taking medications, if pregnant, or if nursing, always consult with your primary medical professional prior to any health care changes. Avoid eye contact with any pure strength essential oil. 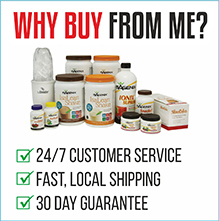 How Do I Buy the Isagenix Oil Peppermint?